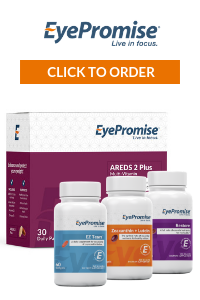 What Vitamins Are Good For My Eyes? Adding powerful antioxidants to your diet can improve your eye health. Researchers have linked eye-friendly nutrients such as lutein/zeaxanthin, vitamin C, vitamin E, and zinc to reducing the risk of certain eye diseases, including macular degeneration and cataract formation. Lutein and zeaxanthin are important nutrients found in green leafy vegetables, as well as other foods, such as eggs. Many studies have shown that lutein and zeaxanthin reduce the risk of chronic eye diseases, including age-related macular degeneration and cataracts. Vitamin C (ascorbic acid) is an antioxidant found in fruits and vegetables. Scientific evidence suggests vitamin C lowers the risk of developing cataracts, and when taken in combination with other essential nutrients, can slow the progression of age-related macular degeneration and visual acuity loss. Vitamin E in its most biologically active form is a powerful antioxidant found in nuts, fortified cereals and sweet potatoes. It is thought to protect cells of the eyes from damage caused by unstable molecules called free radicals which break down healthy tissue. Fats are a necessary part of the human diet. They maintain the integrity of the nervous system, fuel cells and boost the immune system. Two omega-3 fatty acids have been shown to be important for proper visual development and retinal function. Zinc is an essential trace mineral or â€˜helper molecule.â€™ It plays a vital role in bringing vitamin A from the liver to the retina in order to produce melanin, a protective pigment in the eyes. Zinc is highly concentrated in the eye, mostly in the retina and choroid, the vascular tissue layer lying under the retina.